PARCO is supported by people, namely our employees. Our people make full use of their knowledge and spirit to ensure that they continue to provide customers with innovative solutions. This, in turn, earns PARCO the support of both our tenants and their customers. We understand that crafting an environment where every employee can contribute to the fullest is important to all stakeholders, and that is why PARCO is advancing internal systems to promote diversity and cultivate an open corporate culture. PARCO promotes diversity management because we believe that hiring and cultivating motivated employees with diverse abilities and characteristics creates new value, contributing to the improvement, development and growth of our business. The Diversity Committee has been established comprising members from across the PARCO Group to ensure our hiring practices are inclusive and that we maximize the diverse abilities and characteristics our employees. The Committee contributes to business activity that incorporates diversity considerations, cultivating dynamic group-wide internal communication and awareness-raising activities, and creating an inclusive company culture through networking with external groups and organizations. The Diversity Committee is discovering new ways of thinking about diversity management by carrying out internal research, introducing new systems by conducting trials of flexible working styles for a diverse staff, and interacting with external organizations, as well as taking action that will lead to a diverse range of working styles. In 2005 we launched PARCO Women’s Network, a company-wide project that aimed to promote the active participation of women. 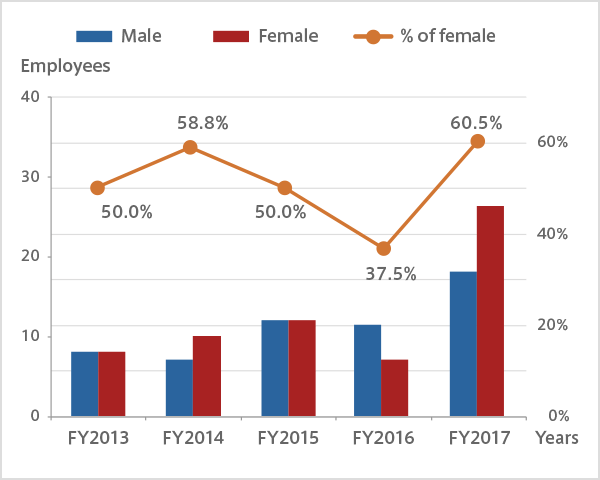 Since 2011 it has developed into the Diversity Project, broadening its scope beyond gender to cover all diversity and inclusion issues and has engaged in a range of activities to raise awareness and build an inclusive company culture. The Diversity Committee was established in 2014 to respond swiftly and flexibly to changes in the business environment, such as globalization and market competition, and to put a greater emphasis on the promotion of diversity management, in line with PARCO’s management strategy. The Committee is chaired by the president of PARCO and comprises PARCO executive officers and the presidents of each group company, with mid-level PARCO Group employees participating at the working level. The Committee carries out diversity activities with both top-down and bottom-up approaches, and promotes initiatives to further unify the PARCO Group. PARCO is also promoting the dynamic participation of women in its business, supporting employees' work/life balance by reviewing work styles and implementing measures to ensure both work and childcare/nursing commitments can be maintained. As part of improving employee work-life balances, the flexi-time system, which enables more effective and flexible working, was expanded across the company in May 2016. The system makes it possible to adjust daily schedules to fit both work and personal plans, and this greater individual input into working hours is proving successful in leading to higher productivity. This has also resulted in employees becoming more conscious of working time and making their work more effective. The flexi-time system had already been introduced at head office, and following a trial period at certain PARCO stores, it has now been introduced companywide. We implement no-overtime days to encourage focused work. We are promoting mobile work (remote desktop service) for employees whose duties involve a lot of time away from the office, allowing them to more effectively utilize working hours by working while travelling and the like, thus increasing productivity per hour worked. In 2015, we ran a pilot system involving employees with child-care or nursing-care responsibilities and other constraints on their work hours. Going forward, testing will be carried out to create a system around this. We are working on creating an environment for ‘focused work and relaxing time off’. Employees need to rest and ‘recharge’ in order to perform at their best and be creative and successful in their work. PARCO actively encourages employees to take holidays by holding an annual ‘holiday promotion day’ and recommending that each division does the same. We also commend divisions which have a high average number of paid holidays taken. We are holding awareness-raising seminars for managers to encourage the participation and growth of a diverse workforce in a way that uses working time effectively and maintains a work-life balance. In September 2016, we held a talk by an external lecturer on the topic of ‘iku-bosses’ (bosses, managers and supervisors who support their teams’ careers and life outside work, ensuring a satisfying work-life balance while still meeting high targets and achieving success for their organizations). We are engaged in providing our employees support relating to both childcare/nursing care and to work. In 2007, 2012 and 2015, PARCO was certified as conforming to the standards for general employers in accordance with the Law for Promoting Measures to Support the Development of the Next Generation through formulating and implementing an appropriate action plan for the establishment of employment conditions. As a result of this, PARCO received the "Kurumin" mark certification. As a result of systems implemented and the atmosphere fostered within the company, 100% of staff have returned to work following maternity and childcare leave since 2012. Working time can be reduced by up to an hour per day, paid. Expired annual paid leave days from the previous year can be revived and taken. Three days of paid leave can be taken when a spouse enters childbirth (including common law spouses). Leave can be taken until the April 10 following the child’s first birthday (permanent employees). This leave can also be extended until the child is 18 months old in certain cases, such as when the child cannot get a place at a daycare facility. Up to a year’s leave can be taken per applicable family member, which can be divided into as many as three separate spells. Employees can request a specific department to return to after taking childcare or nursing care leave. In principle, they cannot be transferred from this department for two years after returning. Working hours can be reduced by up to an hour per day paid, applicable until the child turns one-year-old. Working hours can be reduced by up to two hours per day, applicable until the child enters junior high school. Working hours can be reduced by up to two hours per day while nursing care is required, without limits to length or number of spells required. Up to two hours per day designated for reduced working hours can be converted into holidays instead. It is also possible to take a combination of reduced hours and holidays. Employees with children not yet in junior high school or with a family member needing nursing care can select the region within which their workplace is located in order to avoid moving. Employees who resign due to childcare or nursing care responsibilities who apply and have their application accepted can take advantage of a system that allows their rehiring within three years of leaving. 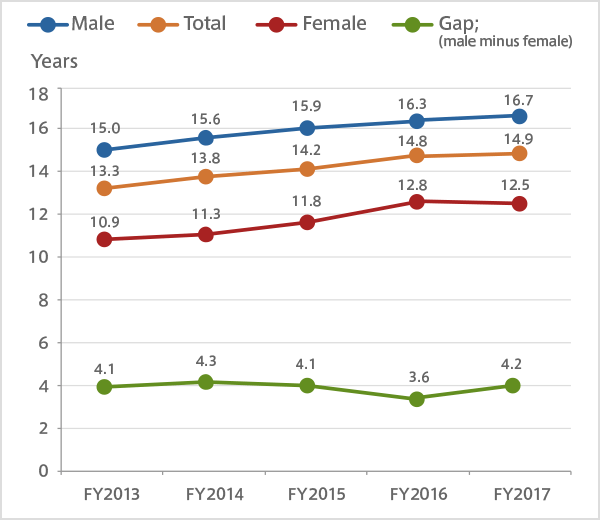 We have set the period between now and June 2020 as the 4th phase of our targets to promote utilization of systems supporting work and childcare (nursing care) balance, provision of employment environment and improvement in working styles. To achieve those targets, we have enacted measures that promote reviewing working styles and awareness of systems supporting work and childcare (nursing care) balance. We are engaged in implementing educational programs geared for different career paths and areas, with the aim of equipping each one of our staff with stronger skills and higher motivation. We are also implementing an educational rotating system that periodically rotates staff between various departments, business areas, and regions, allowing them to widen their horizons and to strengthen their adaptability. Through a variety of workshops, we are working to introduce a competency and ability based career progress system. In addition to the rotating system, PARCO is working hard to support our employees’ capacity for development through providing a wide range of training and learning opportunities. The PARCO Group views efforts to promote greater participation by women as vital, taking steps to embed career seminars, management training sessions and work-life management internally throughout PARCO; we also pursue measures to comply with Japan’s Act of Promotion of Women’s Participation and Advancement in the Workplace (Advancement of Women Act). PARCO promote participation by women through a variety of initiatives. 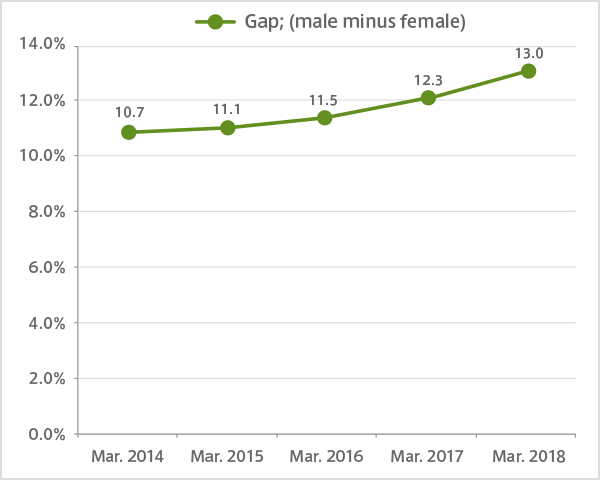 We recognize that encouraging shorter working hours by promoting the use of paid leave and improving the percentage of women in managerial positions will go far in helping to resolve issues pertaining to female participation. Together with enacting measures to encourage taking leave, we formulated an action plan in response to the Advancement of Women Act that includes cultivating female managerial candidates, providing opportunities for boosting the career consciousness of young female employees, and creating a workplace more conducive for employees with time constraints. With respect to the annual average number of days of paid leave taken, we are aiming for 10 days by fiscal 2020, compared to five days in fiscal 2014. 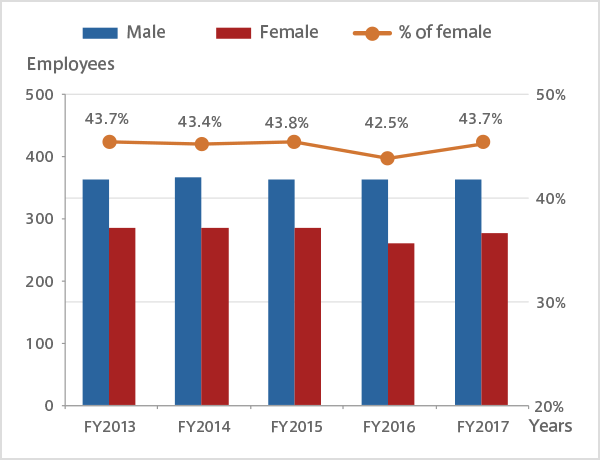 In parallel, we are striving to have women make up 20% or more of managers in fiscal 2020, versus 11% as of March 2015. PARCO takes active part in and shares information from cross-industry consortiums and other projects focused on work and female career education and work-life balance. PARCO’s Basic Principles of Compliance stipulates that all PARCO executives and employees shall conduct fair and highly transparent business activities in compliance with applicable laws in Japan and overseas, social norms, and internal company regulations. PARCO conducts compliance training on topics such as the Personal Information Protection Act and on the risks associated with social media and other online activity. All employees are also required to participate in training designed to prevent harassment by increasing awareness. As part of PARCO’s continuous efforts to improve as a company, we have established a number of internal reporting systems to encourage employees to report violations of laws and regulations so that these acts may be identified and corrected early.